The game has all of the elements needed to grow exponentially bigger in coming years, (relative to the populations of those cities and hopefully more), but strong showings at tournaments such as the Asian Championships will fast-track that development. The eight players profiled play an important role in that future. Zhanghao is the first generation of footy player in China. He began to play football on 2007 and joined the International cup from 2008-2017 represent Team China. He is managing the Guangzhou Scorpions footy club having the southern China AFL. This year is his fourth time to play Asian Champs. Footy has become part of his life. He hopes more and more Chinese can enjoy and experience footy. Huang Jian Long, nicknamed “Tank” joined the Chinese Reds for IC17. He is the most improved player in the Asian footy area. He got the AFL Asia Rising Star award in 2018. After two years training and games, he has become a very excellent player. We hope he can show himself during Asian Champs this year. He also joined the Asian Champs in Manila last year. He doesn't only have the strong body [he also has] a smart mind. He loves football because he can use his body to protect the ball and teammate. He likes the feeling to tackle the opponent on the field. 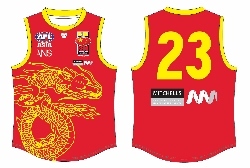 Liu Rong is the best player of Guangzhou Scorpions during SCAFL 2018 Season. He just joined the Scorpions last year. His skill improved so fast and his speed and jump giving us much surprise. We think the Asian Champs will be a bigger stage for him. Also, he enjoys the feeling when he is playing with the teammates and running on the field. Guo Ling is also a very young local player. He began to play football last year and was selected by the coach to play for Scorpions. He had a very good performance and kicked the first goal during the Team China v Asian Lions game in Shanghai this year. AFL is a very good team sport, he likes the feeling when teammates celebrate together when teams kick a goal and when team mates encourage [each other] when the team is down. Wu Gui Lin is the player from Guangzhou Seagulls. He is the hardest player on the field. Through GDAFL games and the SCAFL he has already accumulated his experience for Asian Champs. He said this is his sport when he saw AFL game high mark on the screen. Huang Xin Quan is from Huizhou Hawks. He has already played football for two years and now he is operating Hawks training and games. We hope Hawks can play better and better under his management. He is also a strong player and plays back field [defence]. We hope he can help China Reds in this year’s Asian Champs. Wang Rong Feng is the captain of Guangzhou Seagulls. He likes AFL because footy is a sport combining with foot and hand. He planned to join last year’s Asian Champs but [for] personal reasons he didn't make it happen. But he is very keen to join this year Asian Champs. This year is his third year playing football. We hope he can give China Reds some help to win more games. Cai Zeng Shuo is also a player from Guangzhou Seagulls. He almost joined all the training of the season. He is a passionate player and he is from the Chao Shan area that is also Chen Shao Liang's hometown. We hope he will have a good performance like Chen Shao Liang.